After another busy weekend last week, I'm finally back with more red Farmer's Wife blocks for the Rainbow Scrap Challenge. I was able to complete 6 blocks over the last two weeks! Hooray! While I didn't end up using a ton of yellow as accents in these blocks, I did try to use lots of different shades of red in the different blocks. I was also able to find quite a few red and white prints to use as well. Four more blocks to make this month, and then I'll have 88 out of 111 blocks completed! Since I skipped August, I will need to make a few extra blocks at the end to catch up (I originally planned to do 11 blocks a month for 10 months) and I think I will try to make blocks that "blend" between my already made blocks for when I put it all together. 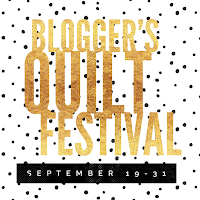 I'm excited to share my entry into the large quilt category for the 2016 Blogger's Quilt Festival -- Candy Shop! This quilt might look familiar because it was featured on Moda Bake Shop this summer! You can still get the free tutorial there. 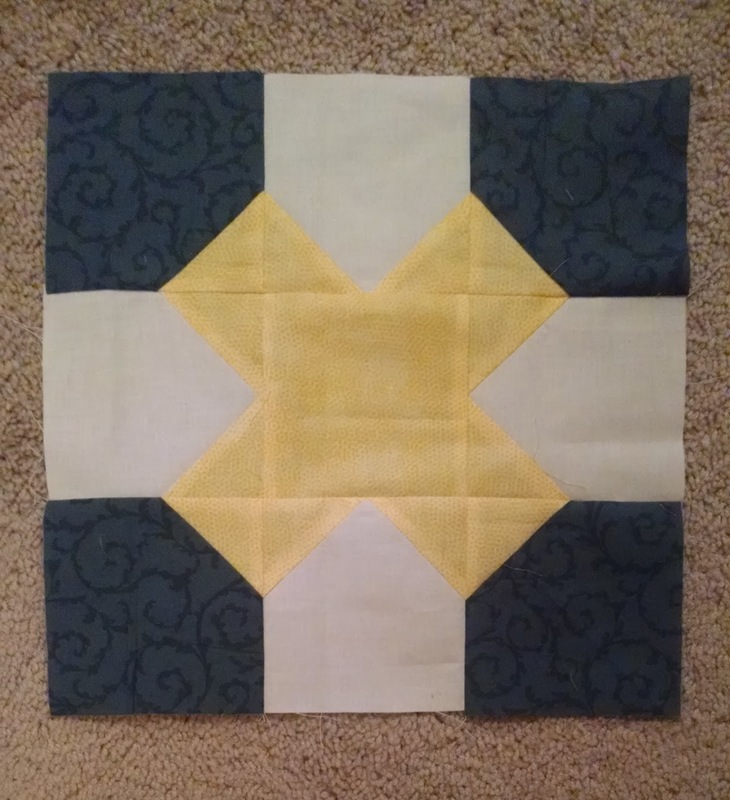 When I started designing this quilt, I was thinking a lot about using blocks in a quilt that weren't square and putting blocks in columns offset rather than putting things into a grid. 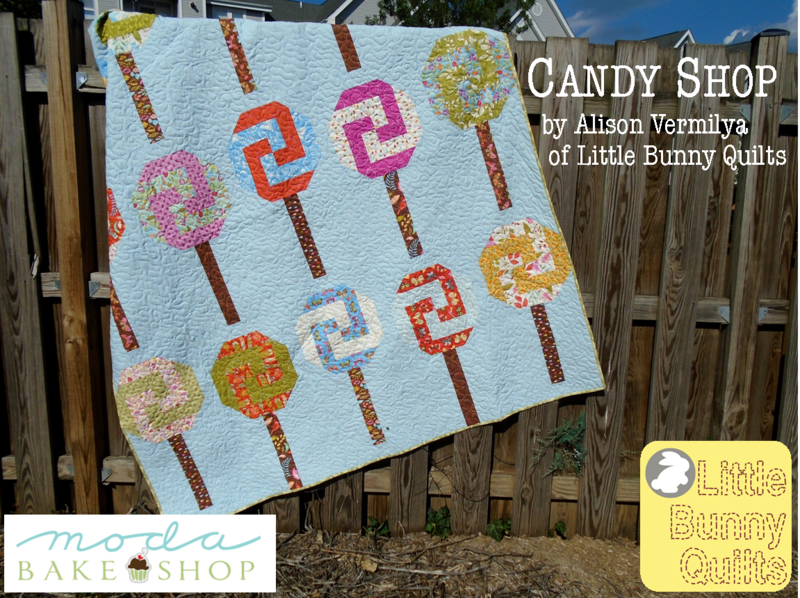 I started playing around with different log cabin blocks to see if I could get them to "swirl" and Candy Shop was born! I quilted this quilt with a directional layered meander that reminds me of waves. Something simple as not to distract from how adorable this quilt is. This quilt is a rather large throw at 68 x 78. It is currently at the Frederick County Fair and I will be going tonight to see if it has won any ribbons! 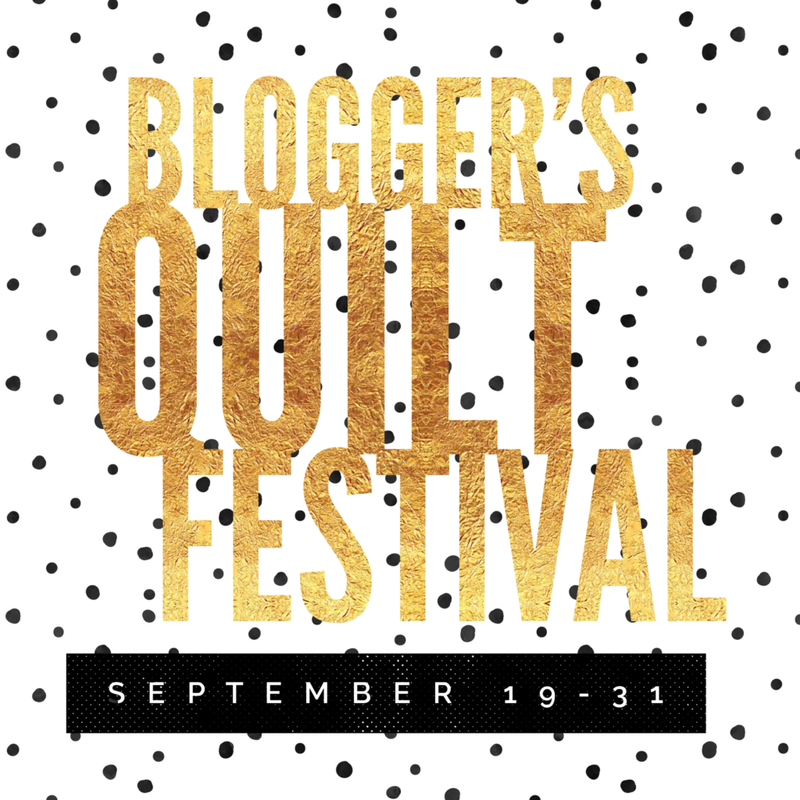 Check out all of the other quilts in the large category here, and the rest of the Blogger's Quilt Festival here! This is one of those "long time coming" finishes! This is my (finally) finished quilt from the Quilter's Choice QAL that I hosted last year. 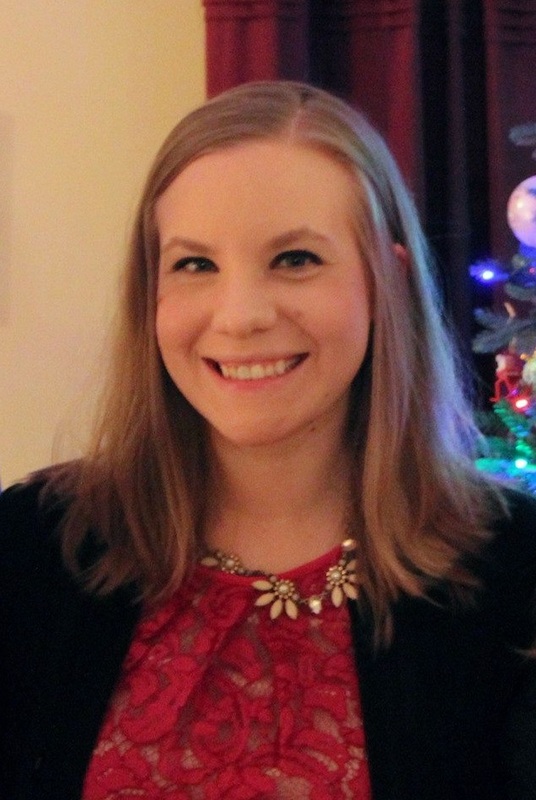 You can click here and see all of my posts and tutorials! My quilt is twin sized and uses the Wallflowers line by Allison Harris of Cluck Cluck Sew. There are three 12" block rows, three 8" block rows, two 6" block rows, and three 4" block rows. 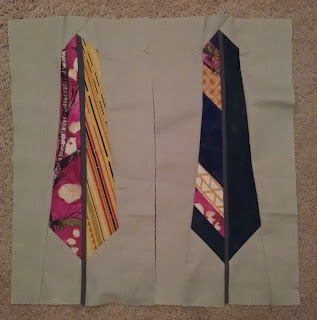 Between each row and along the sides there is a 1" finished strip of white fabric. This quilt was quilted professionally, and each row is a different (yet similar/related) motif -- lots of different sized loops and swirls! It is a little hard to see in the pictures but I love it! The backing and binding is 108" extra wide backing in a green tonal floral. I am just in love with this quilt and am kind of sad that I don't have a twin bed to put it on! I entered this quilt (along with my Candy Shop quilt and my Wishes quilt) into our county fair and I will hopefully find out soon if I won any ribbons! 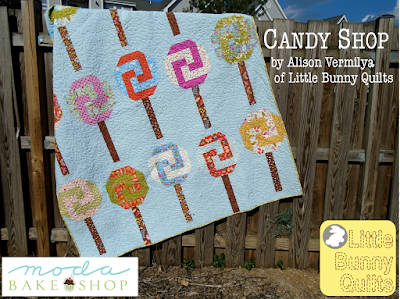 Hop on over to Craftsy to get your FREE row quilt pattern! It's the end of the road for the Summer Solstice QAL, which means it is time to link up all of the finished tops over at Happy Quilting! I didn't cut my sashing strips at the beginning because I was a little tight on my background fabric, so I figured out how big I could make my strips with the fabric I had left, and I ended up with 1.5 inch unfinished strips as my sashing. My quilt top measures 51 inches square, which is a perfect baby quilt size, I think. I do have another black print from this line that is a smaller scale leaf print that I could use for a border (plus pieces of my other black and white fabrics!) but I don't think I am going to do borders with this one and keep it as is. I am planning to quilt this one myself (at some point!) and it will likely have lots of curls and swirls. 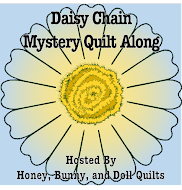 Sharing at Happy Quilting, Fabric Tuesday, and Sew Cute Tuesday! After unintentionally skipping last month in the RSC, I am back and ready to make some red blocks! I don't seem to have lots of red scraps, per se -- it seems like I have a lot of larger cuts leftover from borders and backings. Now on to work on the rest of the blocks! After another busy weekend involving over 20 hours in the car over the course of four days, I was finally able to get back to my sewing machine last night. I got working on my Summer Solstice QAL to finish putting together my blocks. I had sewn together the "parts" of the bigger block before our trip two weeks ago and they had been sitting and waiting to be finished. These went together extremely easily for being 24 inch finished blocks with over 50 units in each! I chose to do the four block layout; here are all four of my blocks together. Next, I will be working on the sashing and borders to finish up the top, which should be relatively simple but I don't think I have quite enough of my background fabric to sash as the pattern. I have extra of both floral fabrics that I used and I have another yard of a black print that I didn't cut into yet. For some reason, this fabric (which is definitely mottled) looks more mottled in these pictures and in the blocks than it did as uncut yardage. Hopefully that doesn't take away from the pattern of the blocks! If you hadn't guessed by my lack of posts, August was a blur. Between family visiting the first two weekends of the month and weddings last weekend and this weekend as well as currently being the owner of a mighty fine head cold, sleeping has won out over stitching one too many times. Once we're back next week, things should get back to normal around here. But until then, here are my last two months' worth of Stash Bee blocks. In July, we made feather blocks. For some reason, mine came out way too big and I had to remake them. Needless to say, I won't be making a quilt of this one myself. In August, we made fun tic-tac-toe blocks. I had to dig around for the right color blue, but I did finally find it!